Ask the Expert. . . How do I Prepare my home for Fall Weather? Fall weather is upon us. It’s starting to get cooler outside, kiddos are heading back to school, and life is falling back into a routine, husbands are gearing upi for Hunting Season, sweaters buried in the back of your closet are looking seemingly inviting, but what about your house? It doesn’t get to throw on a parka when it gets chilly. What can you do to help your home avoid disaster and stay warm and dry this coming Fall? 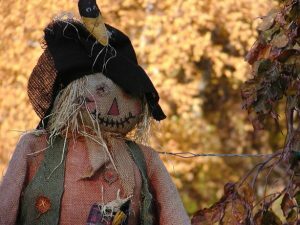 Don’t be a Scarecrow this fall and just sit around hoping you can “scare” away disaster! Be proactive and tackle the cleanup up now to avoid a mess later! At ARS Cleanup, we see several home disasters caused by clogged or damaged gutters. Ice dams can quickly form after Rainy Fall Weather and allow water to seep into your home and wreak havoc. Remove all debris from gutters and check downspouts. If needed, extend your downspouts to the middle of your yard to get water away from your home. 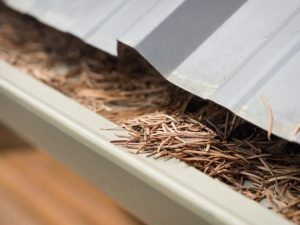 Just because you cleaned them in the Spring, doesn’t mean gutters aren’t already full again! Best to just double check them. Inspect windows and doors for gaps and faulty weather stripping. Caulk and seal air leaks around windows, plumbing, ducting, or any other openings from the outside to inside of your home. For large gaps, use expanding foam. Click http://www.energy.gov/energysaver/air-sealing-your-home to learn more about air leaks in your home. Show your furnace a little love by replacing the filters, look into having your ducts cleaned, and vacuum inside and outside the furnace to remove dust and debris, turn on the heat to make sure it is running properly. Some of the worst home floods we have mitigated, are in homes when the inside temperature is too cold and pipes start to freeze and burst flooding the entire house. Small leaks can cause big damage!!! Fall is an excellent time to inspect and fix leaky rook problems because the temperatures are more agreeable to look in your attic and be on or near your roof. 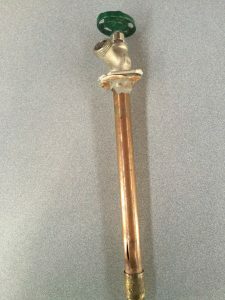 Check for faulty or loose singles, make sure all metal flashing is installed properly around all vents and/or chimneys. Be safe while you are on your roof! Clean and store all removable air conditioners and inspect you’re A/C unit to see that it is clean from debris or critters. Cover it in the winter to keep it clean and ready for use the following year. Clear out ash and other debris or call stove company to maintain your stove or fireplace if you are unable to do it yourself. We reccommend calling a professional chimney sweep to inspect your chimney rather than do it yourself. ARS Cleanup has cleaned countless homes effected by smoke damage from their own fireplace. In some areas, it’s necessary to have your sprinklers blown out to avoid broken pipes. In almost all North Western States, draining outside faucets is essential to keep pipes from breaking due to frost. Above is a pipe that had water left in it and Froze and caused a major flood! Keep in mind, this is a “Frost Free” Pipe! Whoops! Look closely at the bottom and you’ll see the crack. In conclusion, if you miss some of these things before Hunting Season starts, we’ll see you this winter 🙂 For all other questions, call your local ARS Cleanup!